Some of the toughest cuts of beef, such as the bony neck neck, are also the most richly flavored. They require long, slow cooking to tenderize the dense muscles and stringy connective tissues, but that's a good thing. It gives plenty of time for the bones to lend flavor to the sauce and for the collagen from the connective tissues to melt, imparting body and a rich mouth feel. You can use beef neck bones in any recipe calling for shanks or oxtail, but most involve simmering them in a sauce or other cooking liquid. Heat a heavy skillet or Dutch oven on your stove top, then add a small amount of oil. Sear the beef neck pieces on each side, browning them deeply. This step is optional, but adds a great deal of flavor. Transfer the neck bones from your skillet to a stew pot or casserole dish, or leave them in the Dutch oven. 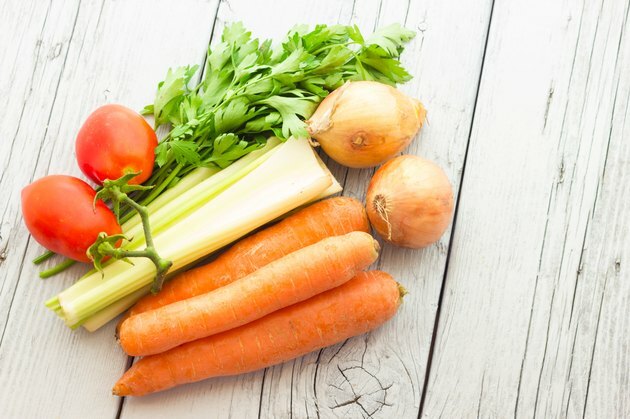 Add any spices or aromatic vegetables you like, such as onions, garlic, celery and carrots. Pour in beef broth, water, thinned tomato sauce or any cooking liquid you prefer. Keep the flavors consistent, using Italian spices with tomato sauce, chiles and cumin for Southwestern dishes, ginger and garlic with Asian dishes and so on. Cover the pot or casserole dish, and simmer it at low heat on the stove top or in your oven until the meat on the bones is fork-tender. That can take three to six hours, depending how thickly the neck bones are sliced. Remove the neck bones from the pot once they're tender. If you cooked them in a thin liquid, strain the liquid and boil it down to a thick sauce. If you cooked them in a sauce, use a slotted spoon to remove any pieces of bone. Shred the meat form the bones, once it's cooled enough to handle, and serve it with the sauce. If you simmer the neck bones in water, they'll make an excellent broth for beef soup or stew. Add vegetables after you remove the bones from the pot, and then finish the soup with the shredded beef. Shredded neck meat makes wonderful ravioli or other stuffed pasta, and if cooked with appropriate seasonings, it's also good in tacos. The American Woman's Cookbook, Wartime Victory Edition; Ruth Berolzheimer, Ed.